Looks like a dash-E, lost sometime by the middle of May, 1942, when the services began painting out the meatball in the national insignia, because gunners tended to fire at anything red. The Navy issued orders to do this, at least, by that time. Maybe a little later for the AAF. 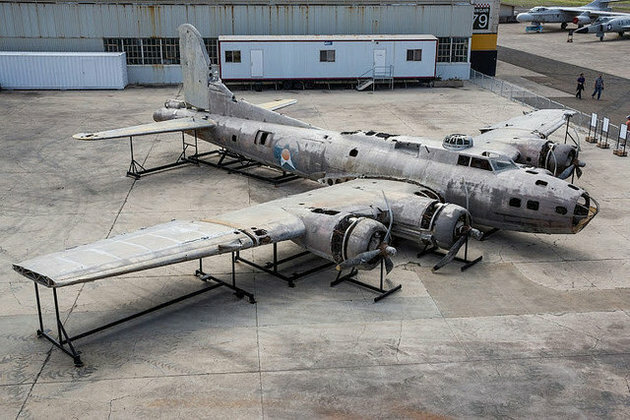 It would be great if she could be restored, dare we even dream, to flying condition. I don’t think there is a flying B-17E in existence. I think the flying aircraft are all -Gs, with the chin turret. I could be wrong, though. I’m trying to see if I can see any colors on the upper surfaces, too. The Hawaiian Department experimented with a multi-colored camo pattern at the time of our entry into the war. It was a combination of olive, browns and tan. Some of those aircraft were redeployed to the South Pacific, some flew at Midway. I’ve got a pair of kits that I want to finish as Midway B-17s, so this stuff is interesting to me. I’d be real amazed if they could get those engines working.